Postać - Pilot. Punkty: 9/12. Wytrzymałość: 9. 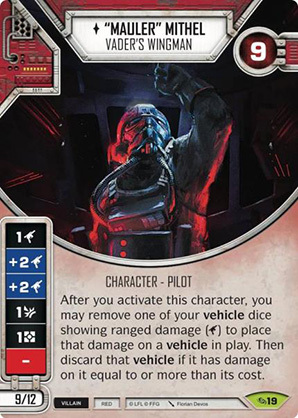 After you activate this character, you may remove one of your vehicle dice showing ranged damage () to place that damage on a vehicle in play. Then discard that vehicle if it has damage on it equal to or more than its cost.